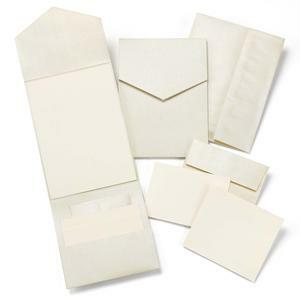 10792 - Champagne shimmer pocket holds ivory invitations. 5 1/2" x 7 3/4" folded. Adhesive dots included. R.S.V.P. reception cards perforate to 4 7/8" x 3 1/2" and 4 7/8" x 4 1/4" respectively. Champagne shimmer R.S.V.P. envelopes and invitation envelopes. Package of 25.